Teaching the concept of fractions to children requires a wealth of visual examples. However, cutting everything in your house in half, in thirds, in fourths and more can become a bit boring -- and messy -- after a while. Fractions games give you a way to provide children with the visual examples they need without dividing up your home. Along with those visuals, children begin to learn how to add and subtract fractions, identify matching fractions and, in some cases, begin translating fractions into decimals and percentages for older children. 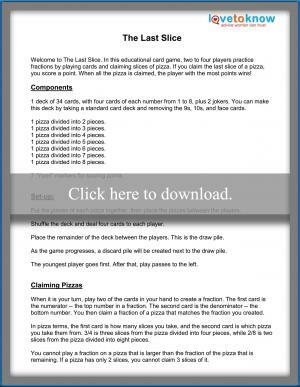 You can download this free game, The Last Slice, to play with your kids. 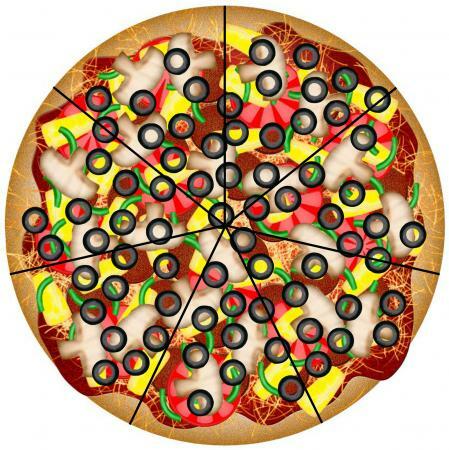 It features colorful pizzas divided into slices, which represent common fractions. Claim the last slice of the pizza to score a point - when all of the pizzas are claimed, the player with the most points wins! You'll need the printable pizzas as well as a deck of regular playing cards to play this game. The download includes instructions as well as an alternative way to play for older kids or those more adept with fractions. Click on the image to the right to download and print The Last Slice. If you have any problems with the download, troubleshooting in Adobe is an easy process. Food is one of the most common tools used for teaching about fractions, but you can only order or make so many pizzas at a time. Instead of using real food, try a fractions game based on foods. Kids will enjoy the competition aspect of the game and relate more to the fractions because they're familiar with the foods they know and love. Pizza Fraction Fun uses one of kids' favorite foods, pizza, to teach them about fractions. The game comes with 13 double-sided pizzas that can be used for playing seven different games. Because the games reach different skill sets, from identifying fractions to adding and subtracting fractions, Pizza Fraction Fun is appropriate for all levels of elementary school kids, and middle school students who need remedial instruction. Parents and children will appreciate the realistic-looking pizzas and the ability to play so many different games with one set of materials. Have a food fight without the messy clean-up! 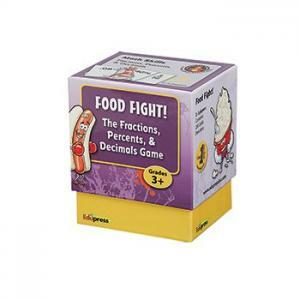 Food Fight Fractions takes an activity that appeals to elementary and middle school students and turns it into a fun fractions game. No, students do not actually have a food fight. Instead they fight to match up foods that have been divided and learn fractions as they complete sets to figure out which card does not have a match. The game is designed for grades 3 and up. Auntie Pasta's Fraction Game also uses pizza to introduce fractions to children from ages 6 to 8. In this game, children race to be the first to put together and box three pizzas in a row using the fraction cards shaped like pizza slices. While playing the game, parents should talk to children about the fractions they are making to avoid the game simply becoming an exercise in putting together pizzas with different toppings. Instead of using pizza like many fraction games, Free-Range Fractions uses eggs. Each egg is two-toned and children are given a card containing a fraction and showing what tone of the egg should represent the denominator. Children race to see who can be the first to turn over the eggs to make the fraction. Special denominator loops are provided to help children group the eggs to represent the fractions as well. The game is designed for ages 8 to 12, but may be suitable for younger children beginning to learn about fractions. While food is a good way to teach children about fractions, pizzas and pies are not the only places fractions appear. Try some games that do not use food to give children even more examples of fractions to improve their knowledge of the concept. Frog Pond Fractions is designed to help children in kindergarten through 3rd grade learn the basic concept of fractions. They travel around the board and collect foam shapes that represent fractions, and can be used to create colorful circles. 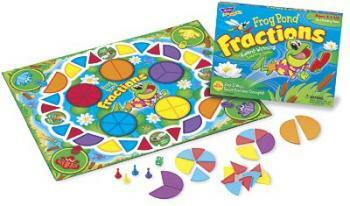 Fraction Matchin is designed for children who already understand the basic concept of fractions. Through fraction tiles and challenge cards, the game has children match, reduce, and practice adding fractions. Special advanced challenge cards are designed to make the game enjoyable for a wide-range of ages and abilities. Flip 'n Link Fractions is another game designed for children who already understand the basic concept of fractions. Children draw fraction cards and place tokens on the board in the quest to get five tokens in a row. The cards they draw and other players' knowledge of fractions can make winning a challenge. For a game that does not look like a traditional board game or card game, try the Fraction Formula Game. Children draw cards instructing them to pick up specific fraction tiles. Those tiles are then dropped into tubes representing "1." The player who gets closest to one by adding different fraction tiles without going over wins the game. The game can be used to help introduce younger children to fractions, but will be more fun for older children who must use their knowledge of fractions to strategically decide whether to play tiles or hold them and avoid going over 1. Fraction Whirl I and Fraction Whirl II turn identifying fractions into a game similar to the popular card game War. Players are dealt stacks of cards with fractions represented as pictures and numbers on them. Each player turns over a card and the player with the largest fraction wins the cards. The player with the most cards at the end of the game wins. Since the game requires knowing the values of fractions, it is best played by children who already have a basic understanding of fractions, such as those in upper elementary and middle school. Games are a good tool for helping children see visual examples of fractions and learn to manipulate objects to create them. After playing these games, encourage children to make fractions using items around the house or to point out examples when they see them. You can even take the challenge cards or game pieces from many of the games and use them in a fraction hunt around your own home. Games and finding real-life examples will help ensure your child knows his fractions well when he goes to complete worksheets and word problems in school. For help with downloading the worksheet, check out these tips.